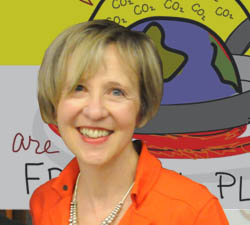 April 2011 – Climate Mama Extraordinaire! April 22nd is Earth Day and everyone seems to put their best “green conscience” forward in April! We are STEPPING IT UP TOO, and are incredibly honored and excited to bring you a special visit with a unique and provoking Climate Mama, Franke James. Franke embodies environmental and social change, and inspires others to follow her lead through her actions, writing and visual essays. Her book, “Bothered by My Green Conscience” and her visual essay “What Can One Person Do, When 6.8 Billion are Frying the Planet?” have been read by people all over the world. 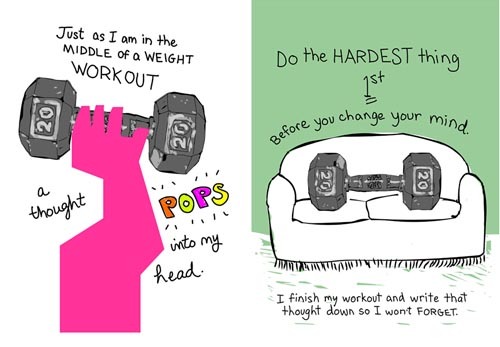 Join us as Franke shares with us why she “does the hardest thing first,” and then tells everybody! Franke helps us understand how each of us can make a difference, and why we shouldn’t underestimate the positive impact our actions will have around us. Franke James, author, artist, and speaker on the environment and social change. I am currently organizing a show of my climate artwork, sponsored by Nektarina, which will tour eastern Europe from May to August, 2011. Also, watch for my newest essay, “Who Cares About the Forest?” coming your way, mid-April. Climate Mama: Parent or grandparent? I am a parent of 2 “kids” in their 20’s, with careers in software engineering and investment banking. Climate Mama: Can you tell us a little bit about yourself, the steps you took, life events, decisions you made, that helped you arrive at where you are at today? Franke: I always knew I was an artist. I got my Bachelor’s Degree and Masters in Fine Arts, and worked for many years as an interactive designer, photographer and writer. But it wasn’t until I combined my ability to draw with my passion for the environment that I really found my main purpose in life (and art). That essay opened the door to so many opportunities. Since 2007, I’ve created about 25 visual essays and talks, which are all published online. In fact my book “Bothered By My Green Conscience” came about because New Society Publishers spotted my essays online and asked if they could publish them. “If you’ve got something to say, don’t wait for permission,” just go ahead and do it. Following that philosophy has got me where I am today. I never expected to be having so much fun, and learning so much, at this point in my life. When I was young, I thought middle-age was going to be dull. But “Wow!” I’m having fun. The most amazing things in my life have happened when I have been stubborn about doing what I believe is right. One of those stubborn moments happened when we sold our only car, an SUV. Because we didn’t have a car anymore we wanted to rip up our interlocking brick driveway and build a green driveway that would be good for the environment. But city officials told me it would be “illegal” to do that — and that really bothered my green conscience. So, I just (stubbornly) decided that I wasn’t going to listen to them and very quickly things snowballed into lots of media attention. “Paradise Unpaved” explains it all – but long story short, I got my green driveway. The media attention helped, but actually calling City Hall and telling them what I wanted, and why it would be good for the environment is what ultimately made the difference. It made me glad that I took a stand. Conventional thinking is that you should go along with the crowd, don’t make waves – but in my life, all of the really big life-changing moments have happened because I did what I believed in. Standing up for what you believe in will change other people’s view of who you are, and what you’re capable of – and it will change your view of yourself too! Climate Mama: What inspires you to keep going, to keep fighting this challenging battle against climate change? Franke: I imagine my future grandkids asking me what I did. I don’t want to say, “Nothing.” I don’t want to tell my future grandkids that I sat on my hands and did nothing while emissions kept rising, while the ice caps melted, species disappeared, and the oceans got more acidic. I really think that future generations will curse us, and say we were stupid, and selfish and mean. So, I may not be able to change the world, but I can change my own behavior. I can listen to my green conscience and take action to improve my bad habits. Climate Mama:What are the three greatest challenges and/or opportunities you feel the world faces with climate change? Franke: Great question. I like that you’ve posed it as challenge/opportunity because if we face the challenges as opportunities we can turn this around. So, the 3 big things I see are: human behavior, lack of political will, and time. Human behavior: The good news is that humans are very adaptable. We can change our behavior if we want to. The challenge is that as a species, we often fall into the triple trap of complacency, denial and selfishness. We think that the future will be like the past. We deny that climate change is happening. Or we throw up our hands and say, the problem is too big for me to tackle, so I’m just going to continue living the way I always have. It’s human nature to think of our well-being first, but to beat climate change we have to think of our place in history, and what our responsibility is to people on the other side of the world, and also to future generations. In my writing and my talks, I like to make it personal: “think of your own grandchildren in the future and what their world will be like.” We may not be talking about climate change out loud, but I believe we’re all worried about it. Political will: Politicians have such a short timeframe, and most rank the economy over the environment – but as we’re seeing in the Gulf Coast, and in Japan – if you don’t have a healthy environment, with clean air and water, you won’t have a healthy economy. Time: We’re running out of time and we need to take action now that will set us on the right clean energy path. CO2 is over 390ppm and will soon be over 400 — when will we take action? When it hits 450? The world’s population will soon be 7 billion. By 2050, it is forecast to be 9 billion. That’s a lot of mouths to feed on one small, polluted planet.The bottom line is that not enough value is placed on the damage that pollution does to the environment. Right now, we can dump carbon into the air without a financial penalty. That has to change. We need to get off fossil fuels, and even nuclear, and shift to renewable clean energy: solar and wind power. Where there’s a will there’s a way. Franke: ”It’s something that really concerns me. Our leaders are loafing — denying the reality of climate change and at the same time ignoring the threats of melting permafrost, invasive species, floods, droughts, and more…Ultimately, we don’t have a choice about adaptation. The die has been cast. The CO2 is already up there in the atmosphere, and it’s going to stay for a very long time. The concentration of CO2 in the atmosphere is now over 390ppm. Which means in essence, “We’re toasting the planet.” My visual essay, “What Can One Person Do, When 6.8 Billion are Frying the Planet?” explores ways that people can mitigate and adapt to our changing climate. Each of us needs to develop our own mitigation and adaptation plan. We can’t trust our “leaders” to look out for us. Climate Mama: Do you see any hopeful signs that people are waking up to the dangers of climate change? Recently a group of students in the Boston area, Students for a Just and Stable Future got in touch with me and asked me to get involved with a series of marches and art shows they are organizing to protest coal plant pollution. I donated a poster to them for their cause, and will be writing a post about their event. Why did they reach out to me? They explained that they felt it was time to invite the artists and poets to help people better understand and face the ethical questions of climate change. They want people to really consider the question: “is it okay to be selfish at the expense of someone not born yet?” They told me that my visual essays helped identify the need for reflection on the consequences of our energy choices, that while it might be easy to shut out words, it is not so easy to shut images. Climate Mama: What advice would you give to other Climate Mamas and Papas, steps they can take both as individuals and collectively to help change the course we currently find ourselves on with climate change? 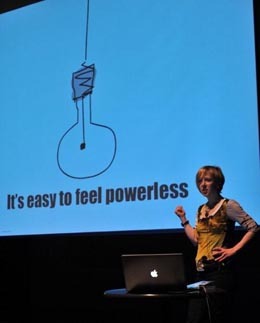 Climate change makes us feel powerless. How can any of us make any difference? I think we regain our sense of power by taking action, and setting big goals. I ask people, “What’s the hardest thing you could do for the planet? Is it changing a light bulb? Or is there something more ambitious you could do that would make a difference in your life? Listen to your Green Conscience and then do something green and tell everyone about it — using stories, songs and pictures.” People of all ages, even very young kids, want to do something about climate change. But the fact is, changing light bulbs isn’t very exciting and doesn’t give you a sense of accomplishment. I say, raise your sights — give yourself a personal goal that’s a little bigger than you’re comfortable with. It will have a ripple effect to family, friends, and your community. Before you know it, you’ll be inspiring others to take action. They’ll say, “If my friend can do it, I can do it.” Get competitive. Choose to reduce your carbon footprint by doing the ‘hardest thing’ for you – whatever that is. Everyone is different. And everyone will have his or her own way. Make it fun. Climate Mama: Other thoughts or ideas that you would like to pass on to our community? Franke: We need to be aware of the power we have to make positive change happen – and get out there and use it. You can make a difference. Don’t underestimate the impact your actions will have on friends and family around you. It will change people’s opinions of who you are and what you stand for. And it will change your opinion of yourself, too. Buy certified green products that reflect your beliefs. Labels to look for are Certified Organic, Fair Trade and FSC-certified paper and wood. Vote for green politicians who understand that a healthy economy starts with a healthy environment. Support NGO’s by taking part in their campaigns, spreading the word and making whatever financial donations you can. Work towards bringing your actions into alignment with your beliefs. Contact information, website, or related story you would like us to link to this article? Read my new essay “Who cares about the Forest?” publish date mid April. Climate Mama: Favorite book or movie? Franke: It’s hard to select just one – but in terms of personal impact, I’d have to say that watching the documentary Food Inc. in Spring 2010, had a life-changing impact. My husband and I switched to eating more organic food and we have gradually reduced our meat-eating to just once a week – which is a huge change as we used to eat meat six days a week. I’ll be creating a visual essay about our transition. There’s a big learning curve to switching to a vegetarian diet, and I’ll be sharing the tricks I found that helped me. Thanks for asking me to share my thoughts with Climate Mama and Papa readers! Climate mama, does it show again? Why, why did you ever let me go? Quite the mama indeed!! Harriet is part of our Green Mom’s Circle of Influence, they and you all inspire and inform me over and over! !